Ocean King 130 has been coordinated for the architectural project part and fitting by inNave, internally and externally designed by the well-known designer Andrea Vallicelli and built by Cantieri Navali Chioggia shipyards (CNC). The yacht is 40.25 meters long, 10 meters wide and with a 170.000 lt fuel capacity. Besides the broad internal spaces, Genesia has a very large external upper deck able to host two tenders and two lasers plus an ample sun deck and a dining area. As the other explorer yachts from the Ocean King series, Genesia has been designed and built to be ale to sail worldwide, dealing with any weather conditions. Conceived and built as a real ship, taking inspiration by tug boats, Ocean King 130 can host till twelve guests in six cabins plus seven crew members. 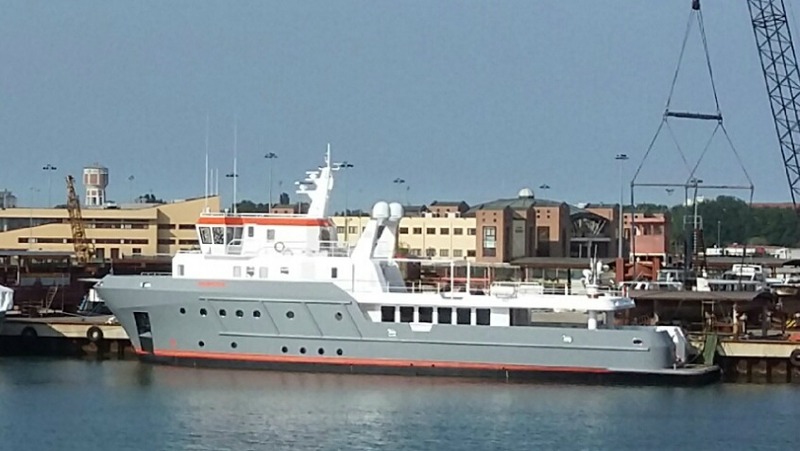 This new boat, following the line of the other Ocean King explorer yachts, is provided with professional technical equipment and not pleasure craft ones; therefore, it can boast a superior technical level of types of machinery, materials, and instruments, which guarantee a professional security and functionality. David Ballarin, the associate of CNC, is more than positive about this launch because it is a new achievement for shipyards in Venice area. Within less than a year from the previous launch of Ocean King 100, Genesia takes advantage of the shipyards investments for the upgrade of the new warehouse in Chioggia. The rise of the shipyards’ quality standard makes it possible to welcome luxury yachts for refitting. Ocean King 130 would not have been possible without the synergy between CNC, inNave team and the professional work of Vallicelli studio. Thanks to this fruitful collaboration has been possible to redesign an existing ship, change some parts and add a bulbous bow in order to increase the efficiency, the cruising speed and the maximum speed of the yacht. The ocean king line grows, but it remains a niche segment for sea enthusiast clients who are looking for a trusted and professional brand and for boat owners who know what it means to sail in safety, comfort, and economy.